Community service has always been an important part of Scouting in Canada and around the world. Many youth and Scouters have a deep commitment to community service, and for many Groups this is their primary focus. Community involvement is a great way for youth to learn and acquire life skills, while positively impacting their surrounding community. To learn more about community service based Groups, and how they increase their membership, we took a few minutes to chat with Group Commissioner, Alex Gazaleh, of the Opemikon Scout Group. The Opemikon Scout Group has managed to grow their Group by almost 95% over the course of the last year. How did they manage this? Through word of mouth, having fun and being active in the community. The Opemikon Venturer Company and Rover Crew offer catering services at Opemikon Scout Camp as well as in and around the Ottawa area. They’re a Group of Volunteers that give their time to cater for the Groups that visit Opemikon Scout Camp in the off-season (September-June). Throughout the summer months, many Scouting youth become employees at the camp. It’s during this time that the youth recruit a number of non-Scouting youth to join their Group the following season. “The youth typically join our Group for two reasons. The first is because of the social aspect of being at camp and participating in activities with their friends and the second is because they’re acquiring important life skills” said Alex. Although the youth work hard in the camp kitchen, they do get to enjoy some down time and participate in all sorts of outdoors activities. From high ropes and swimming in the spring and summer months, to tobogganing during the winter months, the youth members have fun while working hard. With such a wide variety of activities available to them, it comes as no surprise that this Group has grown. To learn more about Camp Opemikon’s Summer Camp Programs and how you can request the Opemikon Scout Groups services, visit: voy.scouts.ca. 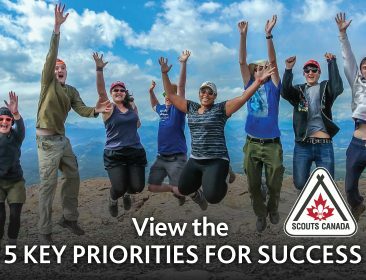 To learn how other Groups have grown visit the Scout Scene Archives for past Group Growth articles.